History links us with those who have been providing Christian service to the community for a century and a half. Our heritage has grown through the years since Isaiah and Sarah Frost conveyed a building lot to the Church Trustees on September 27, 1832. The names in our Memorial Windows remind us of the unseen "cloud of witnesses" who have gone before us. We give thanks for their devoted service and find inspiration from their witness. 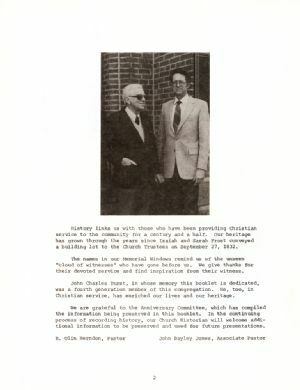 John Charles Durst, in whose memory this booklet is dedicated, was a fourth generation member of this congregation. He, too, in Christian service, has enriched our lives and our heritage. We are grateful to the Anniversary Committee, which has compiled the information being preserved in this booklet. In the continuing process of recording history, our Church Historian will welcome additional information to be preserved and used for future presentations.